The project planned for the Work & Witness teams wasn’t ready. The Sofia Ministry Center, in Bulgaria, had suffered repeated delays in construction. 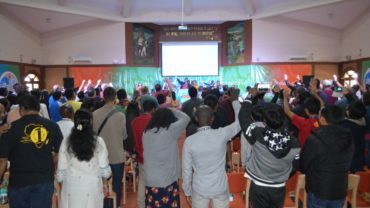 As the dates loomed for the arrival of the combined team of Nazarenes from the church in Kosova and a church in Massachussetts, U.S., the groups were urged to postpone their trip. Everyone thought there would be nothing for them to do. A cursory glance told him the pillars were too high for the planned roof, which was going to be poured the next day. He obtained the blue prints, which confirmed his suspicion. The project engineer was brought in and when she examined the blue prints, comparing them to the building in front of her, she agreed with Adthe. The construction was halted. The following day, Adthe, the local building engineer and the construction crew went back to re-measure the pillars. They discovered that, in fact, the pillars weren’t too high – the beginnings of the roof had been built too low. The Sofia Ministry Center has been a dream of the local Sofia Church of the Nazarene for years. The congregation has been forced to move multiple times because they haven’t had their own building. 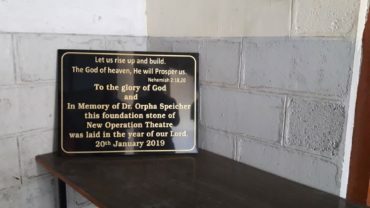 They’d been saving money and dreamed of not only having a church building for worship and discipleship, but a multi-level center where they could serve their community. 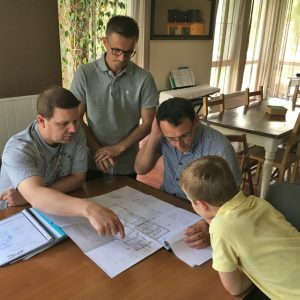 While the setback on the construction meant the mission team didn’t do much with the actual building, bringing an engineer who could save the project was enough. The presence of the Kosovar team in Sofia was the result of a partnership between the Church of the Nazarene in Kosova, and the Wollaston Church of the Nazarene, Massachussetts. The partnership is one of mutual love and support, in which the two churches pray for one another, meet over Skype once a month, and work on ministry projects together, such as assembling crisis care kits for Nazarene Compassionate Ministries. Kosova, which has been rebuilding since a devastating civil war in the 1990s, is still wracked with 30 percent unemployment (60 percent for youth), according to the U.S. State Department. Many people eat just one meal a day. The nation is often on the receiving end of international aid. That has shaped not only the national psyche, but the church mindset, Thibault said. 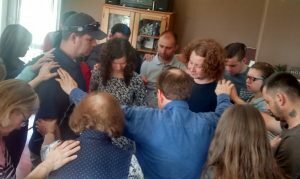 However, the Nazarenes in Kosova are starting to see themselves differently – as people called by God, no matter their resources, to serve others and partner with Him in His mission to their communities and the world. 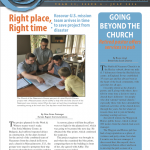 So the Kosova church and the Wollaston church dreamed of doing something even more significant together – which birthed the plan for a joint mission trip. Financially it was not feasible for the Kosova church to raise all the funds needed to go on an international mission trip, especially when people in Kosova don’t get vacation from their jobs, or paid when they’re away. But they managed to raise the fees for their visas, and planned to drive to Bulgaria. The Wollaston church financed the rest of their travel expenses. One young man from the Kosova team actually removed the clothes he was wearing and gave them to a Bulgarian man who was living on the street. 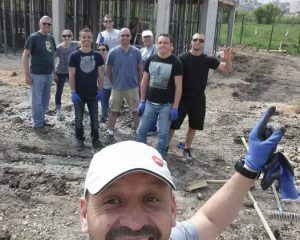 He later said that he had never comprehended why so many people came from other countries to help in Kosova, using their own resources and time. But at the end of the trip, the young man said he now understood the joy of giving, and how it eclipsed the pleasure of receiving. According to Gashi, the trip helped to further instill a missional mentality in the Kosovar congregation. And also cemented their relationship with the Wollaston Nazarenes.